My New Year’s resolution, if you want to call it that, is twofold: one, to go low carb this year; and two, to get to Curves to workout 3 times a week, even if it means dragging my tired self up there on a Saturday to get in that third workout. As part of this, I spent a lot of time in December collecting recipes and starting some meal planning. And I decided a fun way to keep up with the low-carb lifestyle change is to force myself to try new things and to do more than just “meat and vege” for dinner every night or a salad for lunch every day. So I’ve set up a One Note notebook which contains not just my weekly meal plan page but also all of the low-carb recipes I want to try (and I’ve saved this to my SkyDrive so that I can access it not just on my computer but on my tablet and phone, too, with the ON app). Most of them, I’ll be adjusting from their 4-6 servings down to a 2-serving size (which covers an extra meal for later in the week). I’ll also be blogging the recipes after cooking/eating them, because I want to be able to honestly review how they turn out and what, if any, changes I’d make to the recipe if I choose to try it again. So, let’s get started. Changes I made this time are indicated in parentheses. Preheat oven to 350°F. Spray a 7-11″ (9×9-inch) baking dish with nonstick cooking spray. In a large bowl, whisk together eggs, milk, butter, salt and pepper. 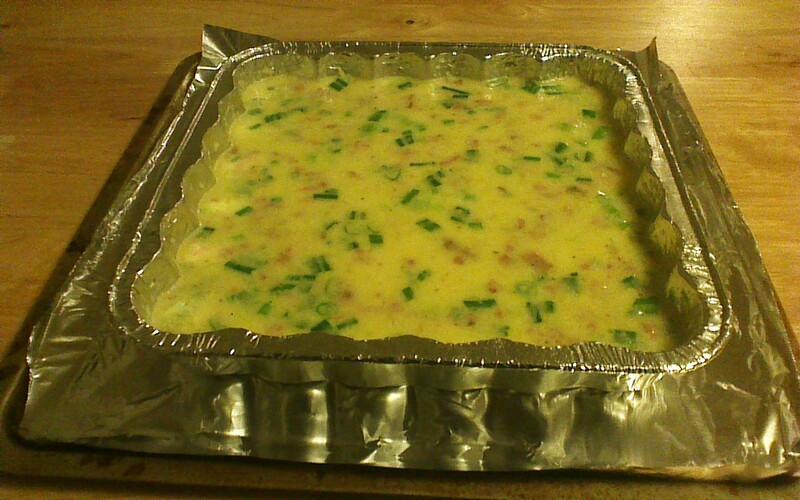 Stir in green onions, bacon, and cheese. Pour into prepared dish and bake, uncovered, for 25 to 30 minutes (35-40 in toaster oven) until a knife inserted in center comes out clean (until just set in the center). 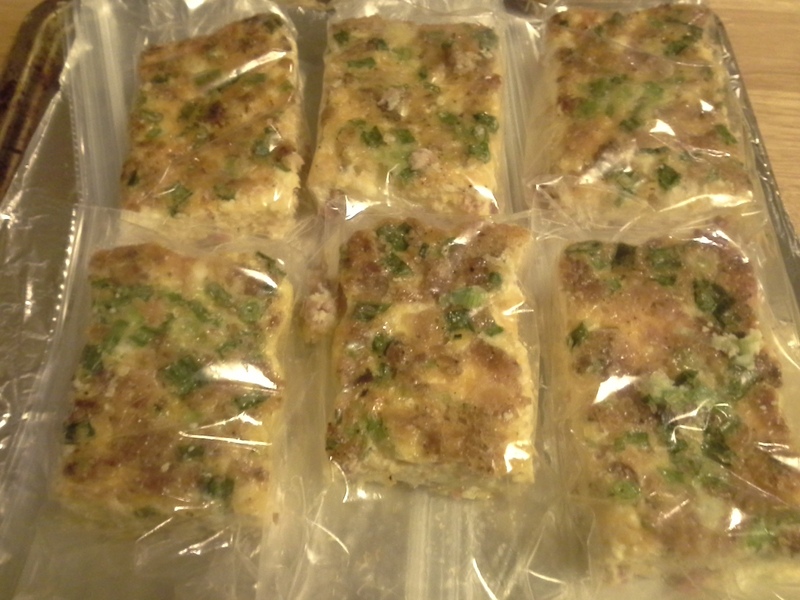 All packaged up and ready to go to work! This is a good, basic frittata recipe. I usually do these in a muffin tin, but I did it in a 9×9 pan instead, and I think it cooked more evenly that way. I used the toaster oven, so it took a little longer to cook than it might in a regular oven, so the original time is probably correct. You want to check it at the shortest time and take it out when it’s just set in the center, then let it sit on the counter to cool completely, if you plan to package it to be re-heated later. If you are going to serve it immediately, you’ll want to cook it until that inserted knife comes out clean. 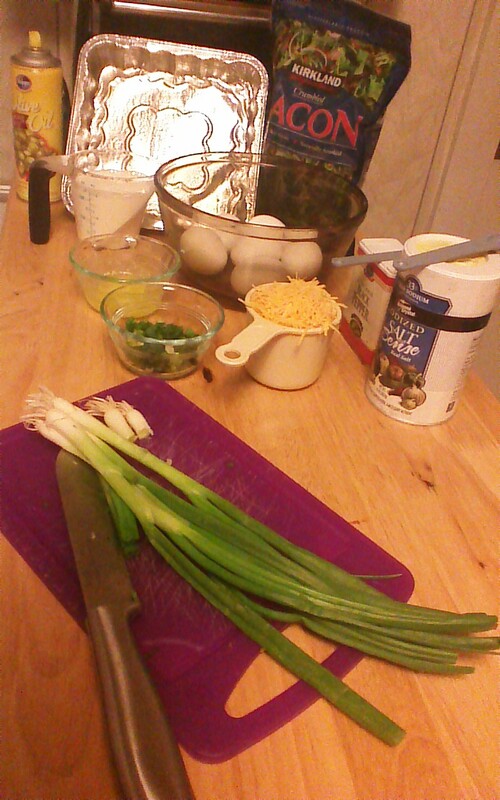 *In the future, if I make this again, I would omit the green onions–even a quarter cup of them were way too strong. I would, instead, soften some chopped white onion in olive oil or butter and add that, also probably around 1/4 cup. I’d probably add more cheese, too. I like that you are trying new recipes. Low carb can be really boring resulting in stopping the diet plan out of boredom. I think spicing it up with new recipes that keep it more interesting will result in sticking to it. I’m always looking for good diet friendly recipes so I’ll look forward to reading what you liked it didn’t like before I try it. Did you share your one note anywhere? It would be good to use as a template.